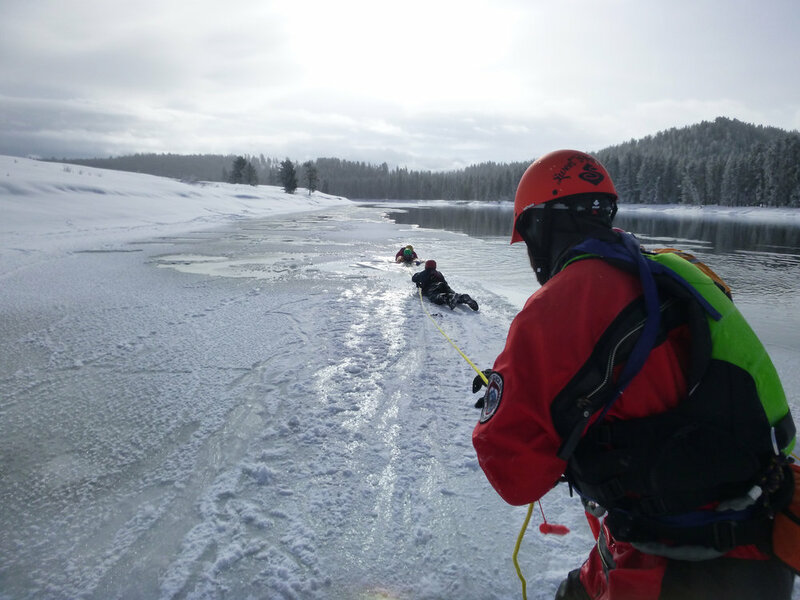 Ice Rescue Technician courses prepare rescuers and field workers to work safely on frozen lakes and ponds. Taught throughout Wyoming, Idaho, and Utah, these courses are customized to the agency or technician and their unique needs. Rescue 3’s Ice Rescue Technician course teaches you how to operate as safely as possible in a high-risk environment. Ice rescue courses are especially valuable for those who work on frozen lakes and rivers, or for emergency service personnel who may be called to respond to an incident where someone has fallen through the ice. During the course, students will learn the unique properties and problems associated with working on and around the ice, self rescue techniques, rescuer safety, pre-planning for and size-up of ice rescue incidents, and victim rescue. Students are taught how to determine ice strength, recognize and deal with cold stress and hypothermia, and participate in various self and victim rescue drills. This 2 day course is valuable training for emergency responders who may have to venture onto surface ice to perform a rescue. In a rescue situation, it is already clear that the ice is unsafe, and therefore this course does not spend a lot of time on ice formation and determining it's strength. Rather, the emphasis is on self rescue and the full range of techniques and specialized equipment that can be used for rescuing others. The curriculum also includes the significant medical considerations for patient packaging and extrication posed by cold water immersion. Field personnel performing work on frozen surfaces face unique challenges. Some of the complexities include the need to identify hazards, working in small teams, and limited access to rescue equiptment. This 2 day course is designed specifically for personnel who venture onto surface ice to perform work in remote areas where professional rescue services will be delayed. Participants will develop their ability to determine ice strength, in part by learning about ice formation. Ice testing procedures will be practiced. Hazard identification skills will be sharpened, and personnel will learn to perform self-rescues and rescues of co-workers. We believe the best learning takes place when practicing with the students/workers own rescue procedures and emergency plans.